I am excited that a catalog and web archive of Notes for a People’s Atlas a project I have been working on for the last 6 years has just been released. Last week AREA Chicago (publisher of the catalog and the magazine which sponsored it throughout the life of the project) along with the DePaul University Department of Geography & Department of Art, Media and Design hosted a release party for the project at the new DePaul Art Museum on the near northside of Chicago. Besides coordinating the effort since 2005 I also wrote an essay explaining how it related to the ongoing work of AREA Chicago and was interviewed in “Social Geographers – Intimate Mediums” for the Bad At Sports blog about mapping projects in general with Ryan Griffis (conducted by and Robby Herbst). See an excerpt of the interview below. Extra special thanks to Dave Pabellon who was the designer for the project and the most consistent collaborator. Additional contributions to the catalog and website come from Samuel Barnett, Euan Hague, Jayne Hileman and Rebecca Zorach. The overall project has been presented in tons of exhibitions and workshops engaged hundreds of people in dozens of cities including Chicago, IL; Zagreb, Croatia; Syracuse, NY; Greencastle, IN; Portland, OR; Granada, Spain; Waterville, ME; Chisinau, Moldova; New York City, NY; Detroit, MI; Boston, MA; Pilsen; Chicago; Santiago, Chile; London, ON, Canada; Sherbrooke, QC, Canada; Ukraine (Uzhgorod, Donetsk, Kherson, Simferopol, Vinnytsia); Gary, IN; and Valparasio, Chile. 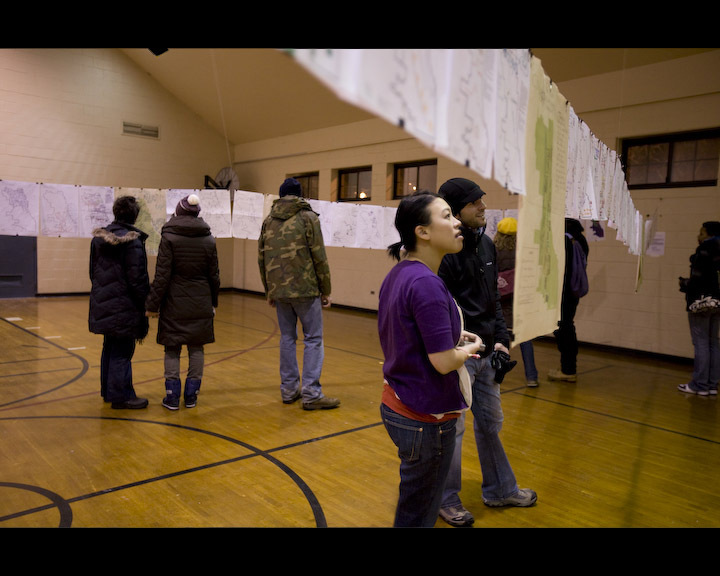 Notes for a People’s Atlas could not have been completed without the help of AREA Chicago, CEC Artslink, Graham Foundation, The Richard H. Driehaus Foundation, Urban Festival, Around the Coyote, and Independent Curators International. Robby Herbst (RH): I’d like to start our conversation off by asking the two of you about magazine subscriptions and postage. What I find immediately endearing about both of your works is that you’ve both developed projects that ideally rely upon readers asking for, or seeking out, a hard copy of a publication or artist project. I am wondering if you could explain to me why, at this moment when new media appears to make it irrelevant, you are using old media to explore place? Ryan Griffis (RG): Both the Temporary Travel Office and Regional Relationships (RR) are small-scale efforts to deal with the tensions between space/place as information as well as lived experience. Personally, I find the complete informationalization of place via electronic devices problematic for a number of reasons. Perhaps we’ll get into some of those reasons, but the short answer is that making a more concerted effort to connect with a smaller number of people in a more sustained manner is more rewarding for me. Our (my collaborator Sarah Ross and myself) initial formulation of Regional Relationships revolved around the creation of a project in a brick and mortar space. We quickly realized that what we really wanted was to get things into people’s hands, where they are. We wanted to materialize the ideas we find important and interesting, and offer them to people in a form that they can sit with and contemplate, but we didn’t want to produce a publication per se. Particularly for RR, the symbolic and material use of the postal service to deliver the work to people is an interesting layer in our questions about ways people and places are part of overlapping, yet seemingly discrete, systems. Matthew Friday, the first contributor to RR, uses the phrase “entangled collectives” to describe the combination of people, other living things, geology and climate that produce our lived experience. I think this describes our interest in mailing things to people; the project isn’t simply the content of any individual work. It also includes the combination of friends, workers, bureaucracies, dead plants, technologies and chemicals that led to someone receiving the work in the mail. All of that may not be “on the surface” of the project, but at least to me it’s impossible not to perceive that on some level. There’s also something to working within (material and financial) limits, and trying to figure out how to sustain the project through direct engagement with its audience. Daniel Tucker (DT): I sure love the internet, but one thing I know from observation is that printed matter can get passed around through networks that (in many cases) would not occur with online media. For example, AREA Chicago, the print publication I edited, would get dropped off in bulk at a community center and handed from a teacher to a student with an enthusiastic recommendation and get read on the spot. Or a contributor to the publication would be given a bundle of 50-100 printed copies of the newsprint publication and would stuff them in people’s mailboxes, hand them out at meetings or conferences that were relevant to their contribution to the issue of AREA. This one-on-one sharing is different than being sent a link, which typically would contain content that could be quickly consumed, as so many online media outlets are known for. It also comes along with the enthusiasm of a trusted recommendation from a friend, one that is helpful in determining and discerning what media one will engage with in the vast world of ideas and images circulating in print and online outlets. In most of my projects however I advocate for distributing the content in print as well as online. I recognize the potential of the internet as a way to circulate rich content with relatively few resources. So this allows local print publications like AREA to be read outside of Chicago and for most of the printed issues to be distributed locally. With Visions for Chicago, I made a website with all of the photos and essays generated by participants, but I still worked with a publisher to produce a print catalog. This was a way of giving something back to the contributors. This affirmed their decision to voluntarily contribute and told them that their ideas were print-worthy and therefore more valuable. So for me it is all about opening the content up to be circulated to different networks of people, communicating commitment to people who do not take online media seriously, and for the content to be in a format that encourages a deeper time commitment than most people typically allow for with online content. RH: I’m interested in these notions of distributions in both of your works because of the way that physical objects, especially literature, passed from person become a map of relationships unto themselves and perhaps identify communities; and in terms of both your works, the quality of these communities vis-à-vis conversations regarding strong and weak tie forms of human relationships. RG: One thing about publications and things like paper zines is that the communities around them operate differently, or at least seem to for me, than internet-enabled networks. That’s a broader conversation, and many people, much more insightful than myself, have written on this… but your delineation of strong and weak social ties is definitely important. This is a central component of the theory of gift economies. To go back to an earlier point, it’s easier to imagine the constellations of forces that bring a package to your mailbox than it is those that bring a website to your computer screen. It’s not that the internet is any less physical or institutional, but the technology and the way we access it, is so completely opaque to most of us. I don’t know if you’ve ever read John MacPhee’s book “Uncommon Carriers,” but it’s an amazing account of the logistics industry; the transportation networks that get commodities from place to place. It’s told through the stories of people who drive the trucks, barges and trains, and it’s easy to connect yourself to their world. For Regional Relationships, we’re interested in how we can talk meaningfully about localities in a slow, distributed and asynchronous manner. What does a conversation look like that takes place over long periods of time, amongst people not sharing the same space and where feedback is sporadic? Right now, RR takes the form of a mostly one-way proposition, but we see them as participating in conversations that already exist in many places amongst many different people. It’s not about starting new conversations, but finding new ways to enter discussions already happening. The conversations that we’re interested in involve those working with and thinking about the connections between places. As I said before, we’re focused on how the idea of place – whether it’s what it means to be “rural”, or how we identify with one geographic region or another — meshes with the kinds of places we create and in some cases destroy. Lots of different people are engaged in different kinds of conversations about this, and we’d like to figure out, for ourselves, how to contribute to them in creative ways. Our thinking is that we can contribute by distributing the creative works of people already participating in some corner of the conversation to others who might be working in other corners. As Daniel said before, there is something specific about a printed object that some people take more seriously. With RR, we hope that introducing an object that asks for some kind of aesthetic contemplation, into an otherwise mostly rhetorical and informational field, will open up some room for other kinds of engagement. I think we’re trying to find a way to generate intimacy within discussions that are generally alienating or hyper specialized. DT: I agree with what Ryan is describing – giving form to “hyper specialized” pre-existing conversations . When I started AREA the initial advisory group (for a list of current and past advisors see areachicago.org) discussed this idea of creating a community newsletter for a community that did not yet know itself or could not see itself. This built on the tradition of having a neighborhood or organizational newsletter that described the goings on of a distinct group of people with the complicated concept of community which is all too often not well explained..
AREA was responding to the existence of a very fragmented local Left in Chicago, which had an incredible diversity and complexity, but no real device for people to see themselves in relationship to one another. People were always trying to form coalitions and have email list-serves, and certainly the bigger or more established groups would try to speak louder for everyone. But there was no forum to simply get to know one another and learn from each other’s experiences. Because the vast geography of the city of Chicago was intimidating it seemed more doable to do this through a publication rather than attempting to create a city-wide community center. Through a slow and consistent process of releasing 11 publications and hosting over a 100 events (many focused intimate discussions amongst people who have much in common but are separated culturally, politically or geographically) AREA has become this connective device over the last 6 years. It is incredible to me the number of people it has touched, and people’s enthusiasm to participate in a hyper-local project, in an era when it is possible to self-organize online with people around increasingly specific and exclusive subcultures. The ongoing engagement with AREA in Chicago illustrates for me some kind of desire to organize around commonality and commitment to a place, rather than subcultural bonds. RH: Would you briefly and tangibly illustrate ways in which your projects have created intimacy, whether in a specialized group, or within a broader context? DT: The Visions for Chicago project I organized last spring involved people using blank yard signs to illustrate their long-term visions for the city. It coincided with the recent open mayoral election in Chicago but it had very little to do with elections. It was more connected to using the occasion of the election to talk about ideas that reached far beyond the typical agendas of elections. Part of my role as organizer was to get people to agree to make these yard signs and then put them outside, in front of their homes and in their windows. I had met so many people through years of art/community organizing, but I had not been to many of their homes. Then their home and their portrait were presented, along with the sign, on the website and in a printed catalog. The publicness of what is traditionally private (their home, their visions) It made the project much more personal and vulnerable. It was amazing when the printed book came out, to see how honored and enthusiastic people were. As I said before the website had most of the same content, but the printed catalog gave people both a sense of worth to their ideas as well as a sense that they were part of a community of a hundred other people who really care about working together at making this city better, engaging their political imaginations collectively. RG: Regional Relationships, being relatively new, has yet to really find what kinds of intimacy and relationships are possible. Many of the ideas that led to us initiating RR came from discussions with people we are close to and trust, like Daniel. It also was largely inspired by our work with a scholar in Urban Planning in Urbana-Champaign whose been engaged in a research project for several years in a small town on the Illinois River called Beardstown. Through our conversations with her, and our own visits to the town and surrounding areas, over the last few years we have made many acquaintances and friends; from commodity farmers to recent immigrants from West Africa, to community organizers. The work we do there now has a certain responsibility to those people. At least we believe we have a responsibility to them. We hope that RR will somehow become a platform for the sharing of these kinds of long term and sustained relationships between communities of concern (a phrase I like that speaks to the shared concerns that bring people together, as opposed to some abstract idea of “community” that assumes a unified group of people). The objective is to somehow make the stakes apparent and meaningful, not simply assume that we all care about the same things. RH: Following up on that I’d like to hear some impressions from the both of you about the Midwest Radical Cultural Corridor. This is a project both of you were (and still are?) involved with on some level- where you came together with folks to travel together physically through the landscape, by train and bus, foot and car . This off course is a very intimate act – no need to describe the shared sweet, hunger pangs, and soars of a road trip. I am wondering what tangible personal and/or public outcomes came from your conscious act of co-drifting through the Midwest together ? DT: When the “Continental Drift through the Midwest Radical Cultural Corridor” occurred in the summer of 2008 I participated in some of the early discussions of what the thing could become – and then I went on the Chicago stops of the drift. I coordinated the release party of AREA Chicago #6 “City As Lab” to coincide with the drift wandering through town. After the Continental Drift phase, the more open-ended concept of the MRCC was turned into an art collective of sorts called Compass. Since that point, I have continued to loosely engage with building a Midwest Radical Cultural Corridor through participating in personal relationships throughout the region, attending the US Social Forum in Detroit in 2010, profiling midwestern farmers in my book Farm Together Now: A Portrait of People, Places and Ideas for a New Food Movement (Chronicle Books, 2010), and through ongoing collaborations with the Family Farm Defenders and Warehouse Workers For Justice; two economic justice organizations in the region that have very real connections to low-wage workers and international social movements. RG: The first “drift” in the summer of 2008 speaks to “intimacy” in an interesting way. It was organized by a small but not deliberately exclusive group of folks across Illinois and Wisconsin. In a lot of ways, the goal was to experience a portion of the region called the Midwest while learning something about the cultural, political and economic inventiveness happening there. We wanted to know how people are creating living experiments resisting oppressive tendencies? For the most part this question was answered through people organizing with those they already knew and worked with within their own communities of interest. As evidenced in the book, those of us involved in conceptualizing the Midwest Radical Cultural Corridor produced Call To Farms, this took us from environmental justice struggles within a black community in Champaign, IL to the Dreamtime Village permaculture-experimental art commune in West Lima, WI to Growing Power in Milwaukee. This trip established an intimacy amongst those of us who took it, It led to our continued working together in the more formal, though still very loosely organized, capacity that Daniel mentioned called the Compass. I think the most tangible or significant thing about the MRCC idea is that it shows the need for (and difficulty of) linking the concerns of people and groups that are not in the same immediate space, but have real stakes in working together and knowing what others are up to. Maybe what I’m trying to get at is the need to think about how conduits between these different efforts and people are made; I think we have been thinking about the logistics of creating intimacy across spaces through interpersonal contact. Therefore people literally as social media! I am wondering if at this point either of you has an answer to this question? DT: Well I never read Ryan’s original text, though it sounds intriguing, but I will take a stab at it. I am often confused by art projects that attempt to critically engage with science and technology. Often they end up producing more interest in amateur science or gizmology alone. I’ve seen this happening a lot around new-media and screen-based mapping projects. How do you dissect the embedded ideology of technology without simply presenting cool looking demonstrations of products and techniques for art audiences? This may mean disengaging from the technology itself, presenting your research, analysis or perspectives in completely other forms. That is one of the things that I think is so successful about Trevor Paglen’s approach. He documents technological innovation of the Military and its black budgets. But he does this with these elegant, blurry, beautiful photos. Rather than building a phone app tracking spy planes, which would position audiences more as military fans than critical observers implicated through their tax dollars. 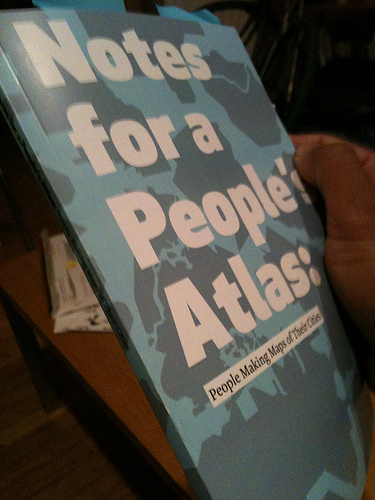 Another example of a project that I’ve worked on that’s engaged this tension is Notes For A People’s Atlas. It has been an initiative to collect handmade personal maps depicting places – it has been reproduced in over 20 locations, including the Pilsen neighborhood of Chicago, the a college town of Greencastle, Indiana, the large city of Santiago, Chile, the region of Granada, Spain, and the country of Ukraine. In this project of vast scale, people always ask me why we don’t use Google maps or GIS, instead of paper and markers, to present the information. On the outside these technologies would allow the information to be treated as data, opening it up for other realms of interpretation. My answer has always been that online maps and mapping software are great tools for dealing with places as data-sets, but if you really want to encourage people to articulate their knowledge of hidden histories and the emotional character of their connection to places, then the simple paper maps are a bare device. People can take them in surprising odd directions, not easily done with those other tools. Ryan mentioned the problem of the ”complete informationalization of place via electronic devices” earlier and I think that efforts like People’s Atlas bring some critical perspective to more consumer oriented maps of cities and user-rated tools like Yelp that turn cities into geo-tagged consumption data sets in a similar way as indigenous mapping that utilizes GIS technology complicates the military origins. RG: Daniel’s response is exactly what I was trying to get at with that excerpt and in the whole essay. While I was responding to so-called “locative media” specifically, I was also responding to the larger historical project of pictorial documentary with its relationship to technology. Another subtext is the effort to use technology against power in “tactical media.” While tactical media practitioners embrace the idea of the “tactic” as inherently the “efforts of the weak” and therefore necessarily insufficient, for exactly the reasons Daniel states I think the limits of this can’t be ignored. What’s at stake in developing responses to power that only deepen one’s reliance on that power? Likewise, and more historically, what’s at stake in representing place through media that by nature alienates and distances the forms of representation from those it represents? Especially when the viewing of these representations actually doesn’t lead to less abstract relationships? I can say I don’t have any answers, and I’m not sure there is an answer. In some instances, an appropriate response would be to “unplug” so to speak. But, as I tried to argue in that essay, I think it’s important to look at the continuations and breaks in how technologies function. If it’s the technological novelty (the “wow” factor) that is the problem with “locative media,” then we simply have to wait until that novelty wears off, just as it did with photography. But assuming that photography is inherently a more transparent, and less mediated, form of representation isn’t entirely useful. I would maintain that there are qualitative consistencies and differences between the two media, and it’s important to keep the content/critique central. It’s knowing what that critique is that’s the real work. Documenting oppression doesn’t require using the tools of oppression, but it helps to know what those tools are since they’re part of HOW one is oppressed.